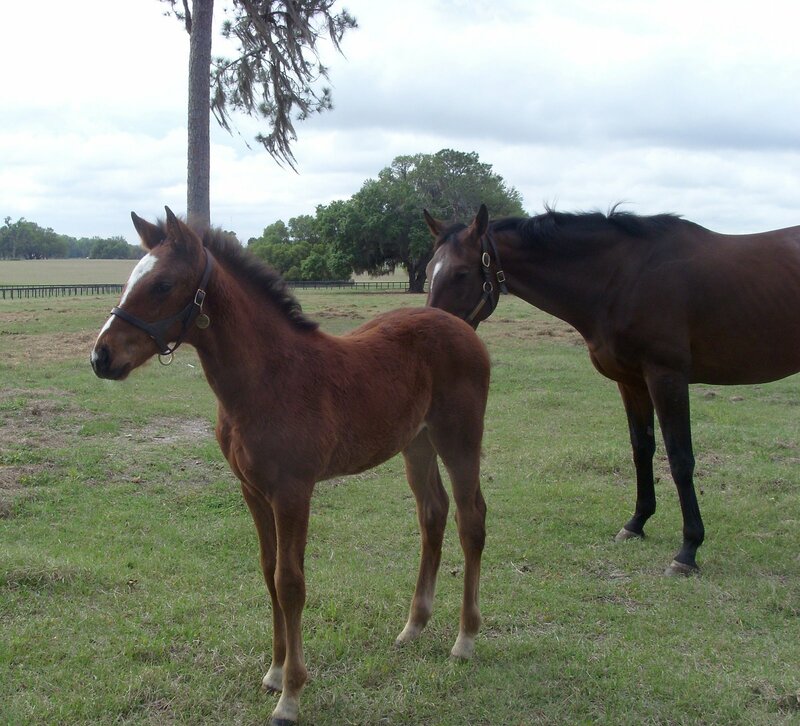 Preparing for my trip to Ocala, I browsed farm information, looking for visitor-friendly sites, easy contact information, and stallions for whom, for one reason or another, I felt a particular affinity. In Journeyman Stud, I found all three. In response to my e-mail inquiry about a possible visit, I received an ebullient e-mail from Crystal Fernung, vice president of Journeyman. “We’d be more than happy to have you visit us,” she wrote, adding that she and her husband Brent, president of Journeyman, would be at the OBS sales, and inviting me to come meet her at their barn on the sales grounds after my visit to the farm. Journeyman in fact comprises two farms: the stallion farm, and the “everything else” farm, where mares, foals, yearlings, and two-year-olds birth, live, grow up and train, getting ready for the sales ring or the racetrack. I was welcomed by Carolyn Brown, who introduced me to manager Ken Breitenbecker, my host for the morning. As morning breeding hours had just finished, Ken drove me to the broodmare barn while the stallions were cleaned up and made ready for presentation. 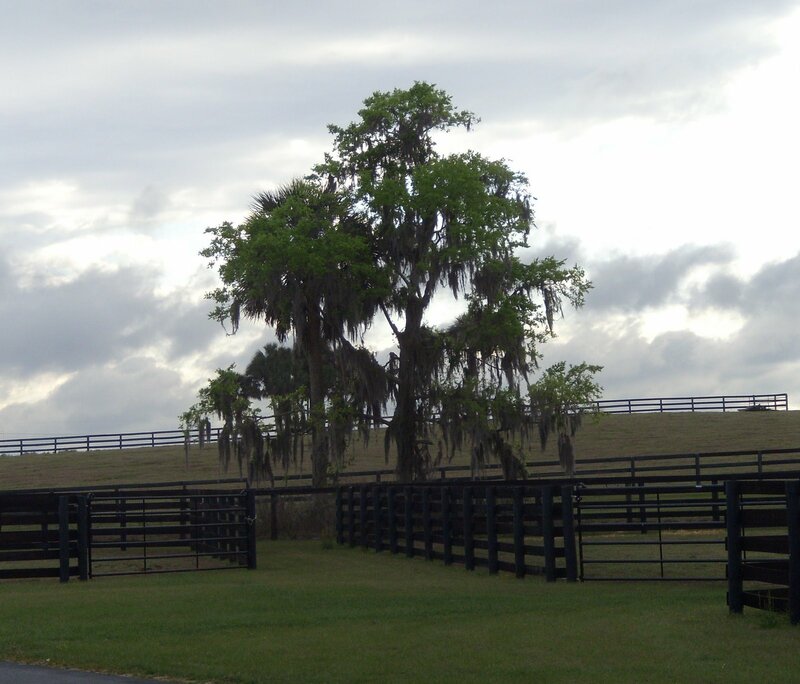 The farm sits back among trees draped in Spanish moss, up on a hill: to the left is a large paddock where horses are regularly galloped; behind it is a paddock full of broodmares and foals; and off to the right is a 5/8 mile jogging track. “Want to go in and see some of the babies?” Ken asked. We walked out into the field, where dozens of mares and foals grazed, lazed, slept. One particularly inquisitive little Gulch foal walked right up, nuzzling my face, sniffing me, while mama kept a watchful but relaxed eye. 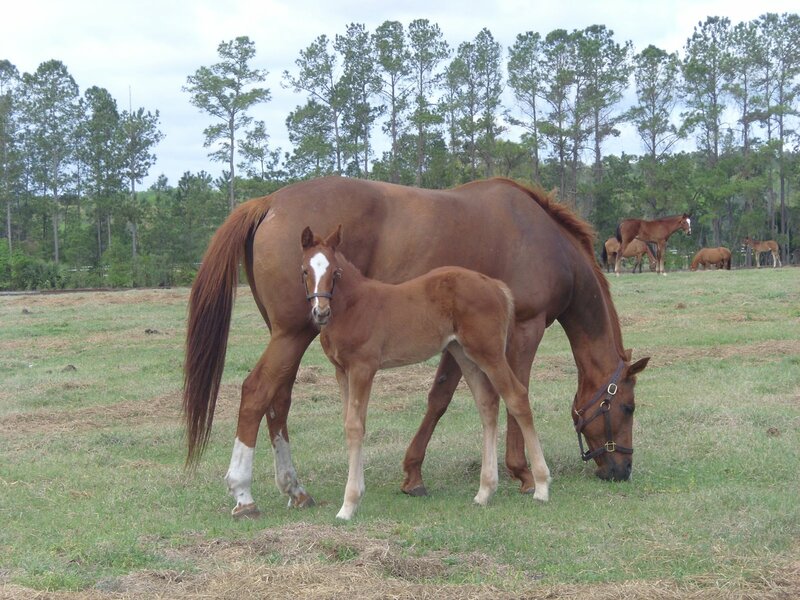 Another mare, suddenly realizing that she had no idea where her foal was, whinnied to him. “Relax, mama,” Ken said. “He’s right over there, sleeping.” As if on cue, a previously motionless little brown mass of fuzzy hair jumped up on scrawny legs, looked around, and answered his mother’s call. She whinnied again, and he called back, spying her across the field and bounding over to find her. One paddock over, an exercise rider took his mount up and down the hills; horses in training get the benefits of both the training track and of this hilly pasture, building different types of muscle and stamina. Back at the stallion barn, Ken brought out Mass Media. 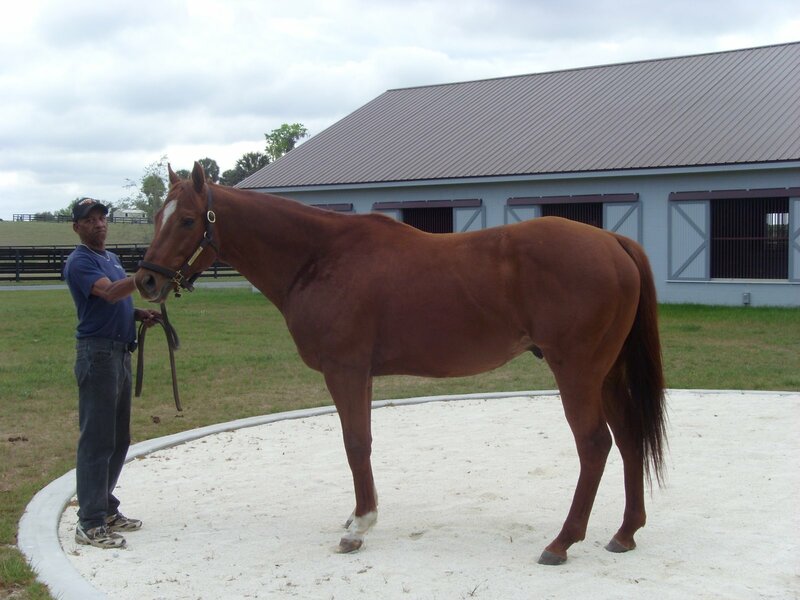 As I recalled his win in the Forego in 2005, Ken noted, “He’s a great horse. He’s got a lot of heart.” We talked about Circular Quay’s terrific two-year-old season, and especially his from-the-clouds win in the Hopeful. Cowtown Cat, near and dear to this hunch bettor’s heart, winner of the 2007 Gotham, stood quietly, posing for photographs. You can see the stretch runs of these stallions’ notable races, along with those of the other Journeyman stallions, from the home page for the farm. You can also find information about the history of the farm; biographies of the folks who work there; philosophies of breeding; and the farm’s facilities. The site is extensive and informative. Thank you so much for the very interesting report of your visit to Journeyman Stud and the great photos! I’d love to be there with you! Great visit – I need to get organized if I’m going to see any in KY this spring. Thanks, folks. 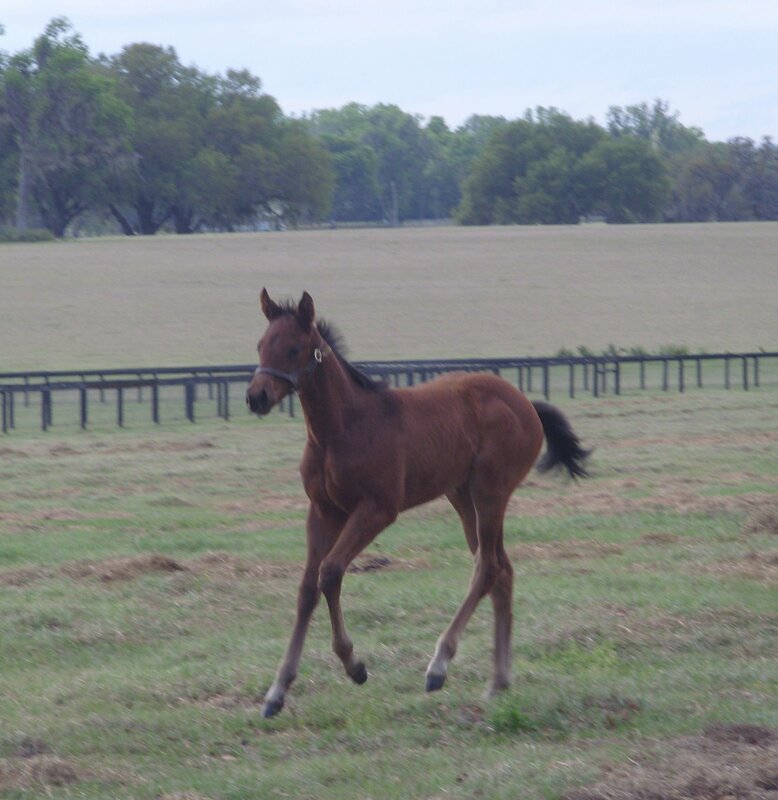 It was a terrific morning–being in the paddock with those folks was amazing.Superfecta: When will you be in Kentucky?